In 2006, older exotic trees grow alongside newer native plantings of swamp flax and sedges at the edge of Christchurch’s Avon River. In the 19th century, the river banks were planted with exotic trees, flowering plants and lawns, as in an English landscape. Over time, the willows and flag irises spread, choking out other plants and reducing water flow. 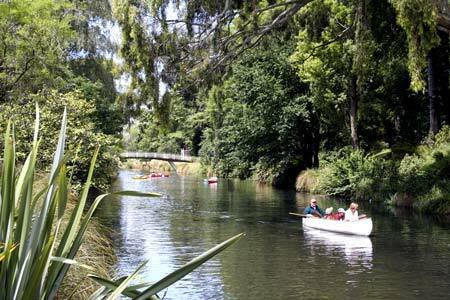 To restore the health of the river and its banks, the Christchurch City Council removed some of these problem exotic plants and replaced them with natives.